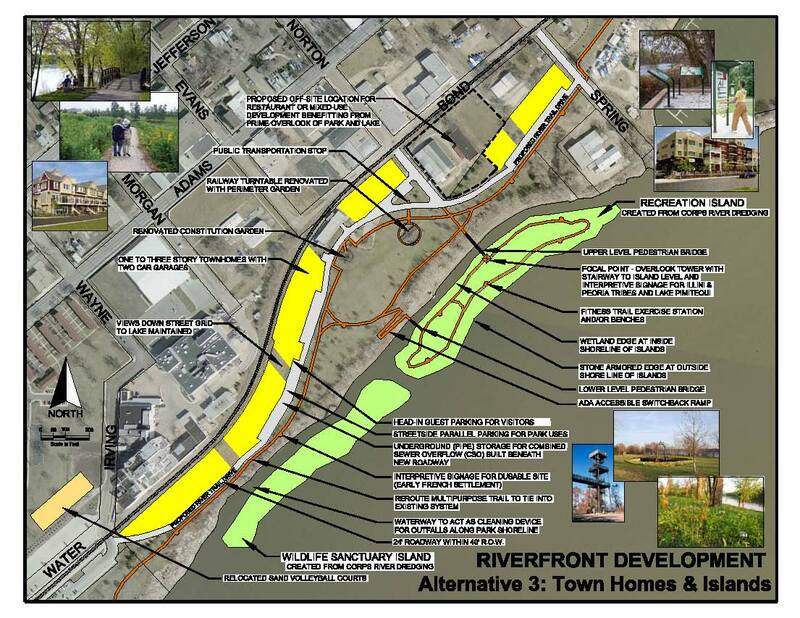 The City of Peoria is seeking a quality developer to develop City owned RIVERFRONT property. 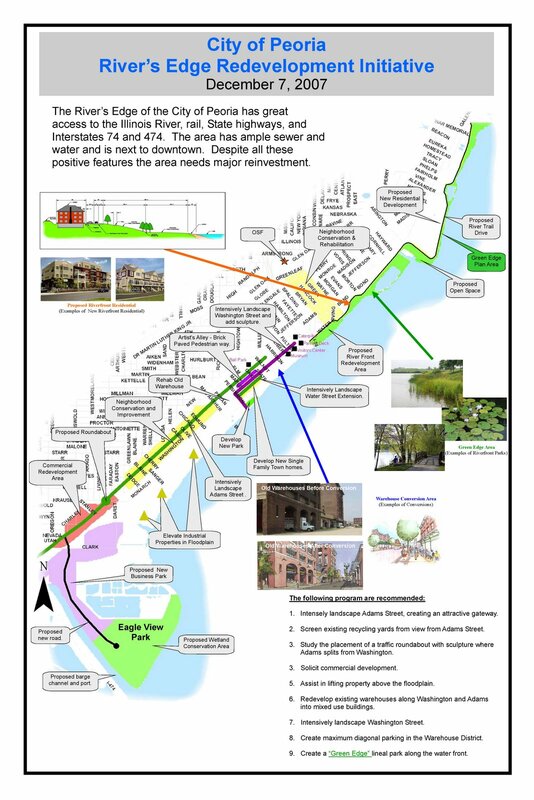 The City Council, the Planning Commission, and the Heart of Peoria Commission have approved the River Trail Concept Plan.Preference is for new urban AND green development. The City of Peoria seeks proposals from qualified developers for the development of the Peoria Riverfront north of downtown. The City owned property fronts a beautiful lake measuring approximately 2.5 miles by 1.5 miles, a lineal park, and a bike trail. The south end of the property is anchored by downtown Peoria, I-74, and the Riverplex. The north end is anchored by the Detweiller Marina.Background: City staffs have developed concept plans for the Peoria Riverfront. Staff gave numerous community presentations and held several charettes to get community input. 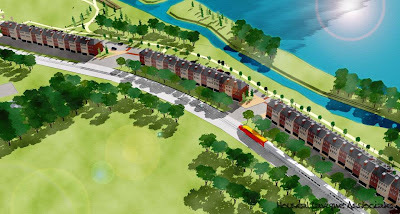 Presentations were made to the City Planning Commission and the Heart of Peoria Commission and they approved the plans for the River's Edge Redevelopment Initiative, the Green Edge Plan, the River Trail Drive Plan, and the Cascade River Plan. 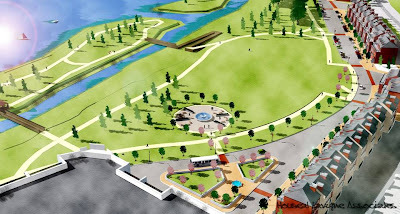 All of the plans were reviewed and approved by city engineering and planning staff. The Concept Plans begins with City owned land, as shown on the attached concept plan sketch. There are approximately nine city owned acres available for development. There is a substantial amount of privately owned land that could be added to the development. 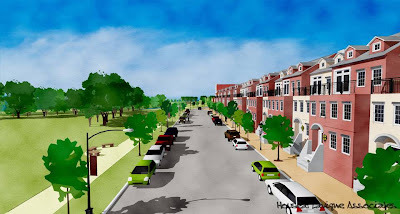 The plan is similar to the famous "Burnham Plan" in Chicago, with a lake shore drive and quality housing to help pay for it.There is a strong demand for housing in and near downtown Peoria. Several market studies have been conducted with the most recent being completed by Tracy Cross & Associates, Inc. The Tracy Cross Residential Market Analysis indicated that there would be a demand for 194 new dwelling units a year in downtown Peoria.Downtown Peoria is the second most densely developed downtown in Illinois after Chicago, boasting over 17,000 jobs. Many of the young professionals employed downtown have indicated a desire to live close to downtown jobs, the river, and the convention center. The City of Peoria reserves the right to reject any and all proposals received as a result of the Request for Proposals, or to negotiate in any manner necessary to serve the best interests of the City. If a minority and/or female owned small business is included, then a Business Plan for that small business must also be included. Meeting / Inspection: City Staff invite interested parties to call or email to arrange a presentation and a walk through of the site. Submittals may be made until one is accepted and approved by the City Council. Nice development on the Illinois River in Ottawa, one hour north of Peoria. It is similar to River Trail Drive, with new urban "green" development overlooking the River and Marina. on the lake in downtown Peoria.